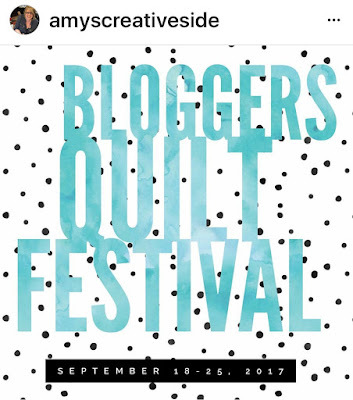 For my second entry into the Fall 2017 edition of Blogger's Quilt Festival, I present to you "Bend, don't Break". See previous post for my first entry and links to past years at the bottom. 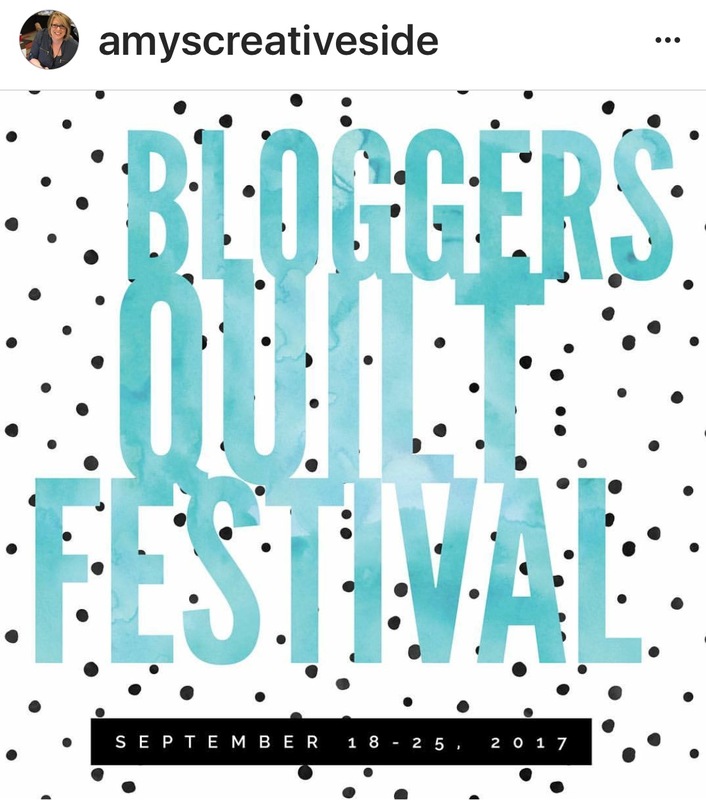 If you're looking to Link Up your 2017 Q3 Finishes, scroll to the post just before this one! Bend, Don’t Break was inspired by the layering of building featured in the spark image and the visual depth they give to one another. For me, being flexible in design and construction is key and also a good reminder in life. Rather than use a predetermined line on a ruler or specific degree for the angles, I chose what felt right and simply built from there. I was incredibly honored to have my quilt juried into QuiltCon East and displayed as part of a Special Exhibit February 2017 in Savannah GA - look closely and you can see the picture taken by Michelle Wilke that the QDAD members used as inspiration. 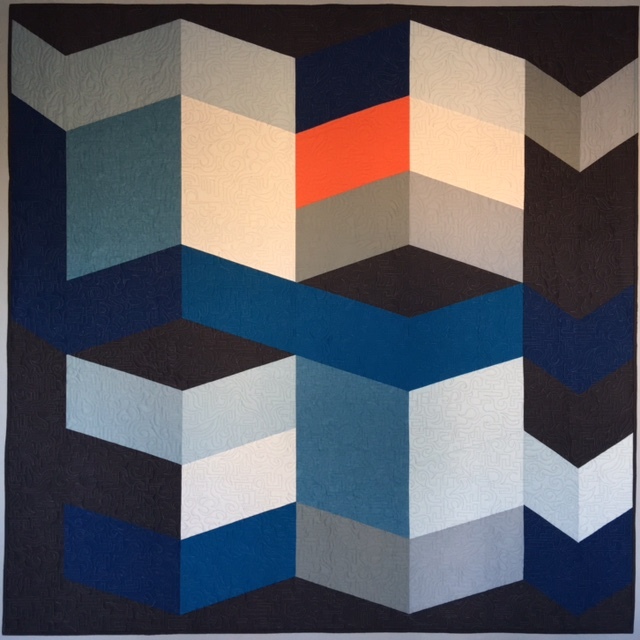 This quilt was a personal challenge because my go to in the past has been Scrappy Maximalist Improv and I rarely set out to create a literal interpretation of a design. Not to label myself but I've broadened out to Graphic Minimalism. In this case I really wanted to bring my #QDAD2Reality so that it was easily recognizable. I printed with the digital design I had created using Inkscape, (a free software program) and included the grid for reference. My first shot at it was way too small a scale - clearing quilt math is not my forte. Proof of my scrappy tendency is the initial stash pull. 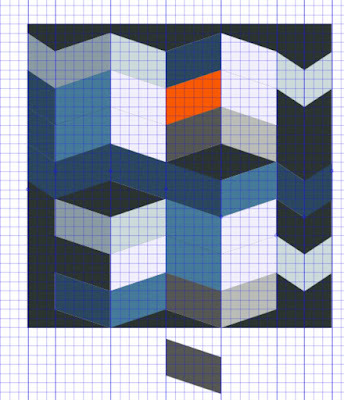 There was quite a lot of prospective fabrics in the challenge color palette. I did end up with a few quick trips to my LQS Hart's taking advantage of their wall of solids when I ran short. Auditioning what goes where as the quilt evolved was a fun part of the process. The same exact fabric looked lighter or darker depending on what was next to it. A trick of the eye made decisions even more fun. Pinning the sheet of paper to the design wall for quick reference while I contemplated the task at hand was a great hint that I'd read about on IG and I hope I'll remember to do again. The back of the quilt also made me happy to make. Here you can see it flipped and shown for scale next to my other entry, the mini "Break". This post would not be complete without a shout out to my generous quilty friend Pat who let me free motion quilt it on her long arm. The FMQ pattern is an overall organic doodle that has sort of become signature style on just about everything since. It wasn't really planned and just came out when I started stitching. It was a little (a lot) intimidating but the spirit of encouragement and "going for it" that is at the core of the group. Above you can see a mosaic that was posted on Instagram. 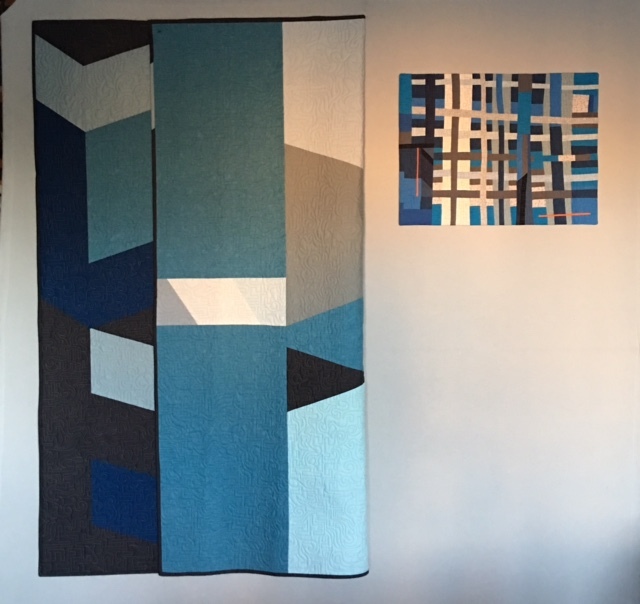 The lower left "Note to Self" was featured in the MQG Quilt of the Month exhibit. I'm beaming with pride having three of my quilts in the show and having contributed blocks to two collaborative quilts made by my incredibly talented #beesewcial mates Hillary Goodwin entropyalwayswins The Story of Us and Stephanie Ruyle spontaniousthreads Direction Optional that took 1st place in the Group Bee category. Don't you've the way I'm pointing to them Vanna White style?! My local MQG proposed a design challenge for our guild members to create based on a photo spark, a similar idea to what the QDAD group does so I shared the process I had used along with several other designs that I had considered (and may someday still make). Pin swapping was not nearly as active in Savannah like it had been in Austin and Pasadena the previous QuiltCons but I do like commemorating the event with a little token. I made several to exchange and this was one. 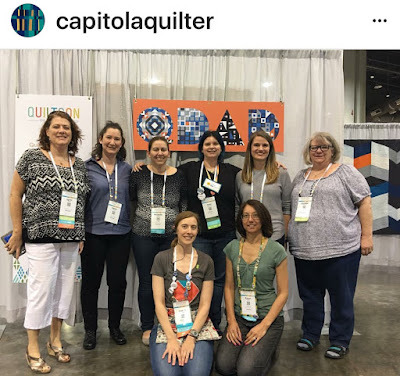 It was fantastic to meet in real life a few of the QDADers and love this group picture - you can see a peak of my quilt in the background on the right. Fun Stuff! 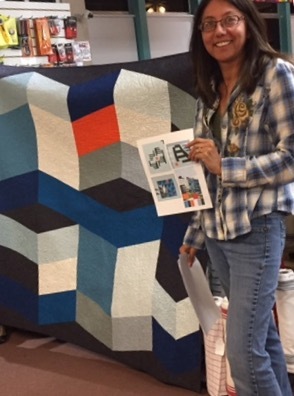 A chance to share a special quilt and the story behind it is much appreciated, so that you Amy's Creative Side. You can see all the link ups HERE. The title fits the piece perfectly. Great composition. Interesting quilt. The quilting pattern is so unusual! 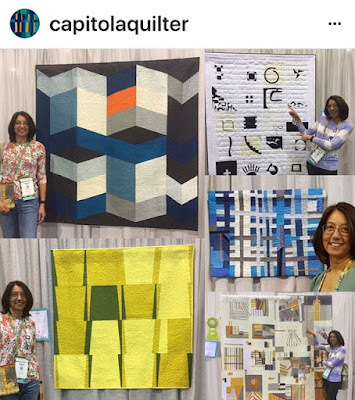 Thanks more background on your quilt (which I saw at QuiltCon.) I love getting a glimpse into the design process of others! I've seen a couple of other events at other places, but this was my first time in here. It was amazing! Great Seattle venues, it's smaller than those bigger places but it is still a fair sized venue. Food was great and I think it's recently renovated - it didn't seem old or anything.